Super 16: Can Lundqvist remain 'The King'? Henrik Lundqvist signed a legal document Wednesday that will pay him a lot of money to stop hockey pucks for the New York Rangers until he turns 40 years old. Lundqvist almost certainly will finish his career with all of the important team goaltending records, and someday his No. 30 could hang from the rafters at Madison Square Garden IV (or V). While his legacy with the Rangers could be affected by whether or not there is another Stanley Cup banner at MSG by the end of the 2020-21 season, where Lundqvist might rank among all NHL goaltenders could make for an interesting debate around that time. He is a five-time Vezina Trophy finalist but could use another one or two of them on his resume to be in a discussion with the all-time greats. Twelve goalies have won the award at least three times, though it's possible to argue that there are so many great goaltenders from this era that winning that trophy several times is going to be nearly impossible moving forward. Obviously there will be people who judge Lundqvist differently if he never gets his name on the Stanley Cup, but he is playing in an era of Cup-winning parity unmatched in League history. Save percentages and goals-against averages are not comparable between eras, and hockey doesn't have its own widely accepted version of Wins Above Replacement that allows a baseball fan to more easily compare Mike Trout to Mickey Mantle. 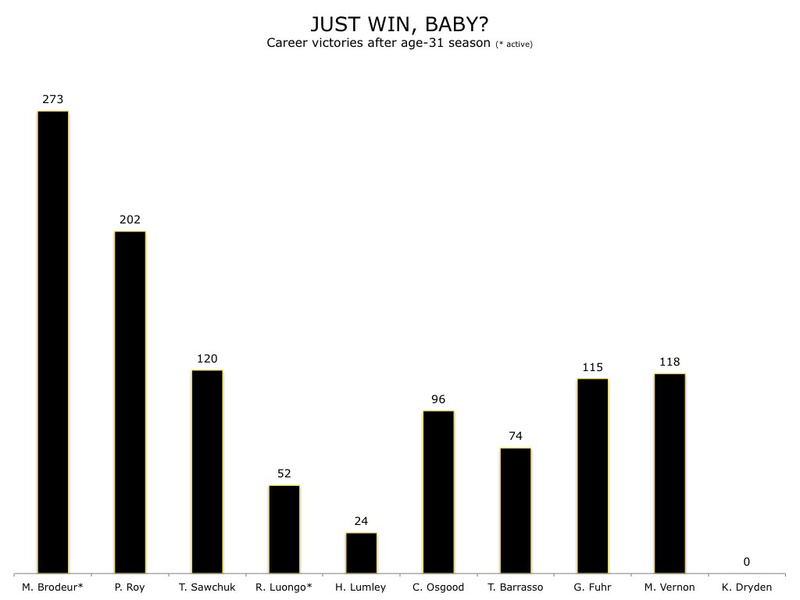 One thing Lundqvist has done a lot of is win. He has 284 of them in the regular season in his career, which is tied for 34th in NHL history. He’s won at least 30 games in every full season of his career, and a combination of the young talent the Rangers possess and the expected rise of the salary cap should allow New York to continue to support Lundqvist with a competitive team. Lundqvist averaged 36 wins in his first seven NHL seasons and was on track for 40-plus in a full year in 2012-13. If he averages 30 for the rest of his career (building in some leeway for either a major injury or a small decline in his play), he can surpass 500 wins. Only two goalies in NHL history have 500 wins, Martin Brodeur and Patrick Roy, but it's conceivable that Lundqvist, Ryan Miller, Marc-Andre Fleury and Roberto Luongo could reach 500 by the end of Lundqvist's career. If he averages more than 30 per season, Lundqvist would have a shot at catching Roy's 551. To do so he needs to prove he can be successful and durable for a long, long time. Below is a chart of the goalies with the most victories at this point in Lundqvist's career (he will be 31 years old Feb. 1, so this is his age-31 season). Obviously Lundqvist could move up that list a lot by the end of this season. Also of note is Fleury. He has absorbed a lot of criticism, but his age-31 season isn't until 2015-16 and he could be second among this group by then. 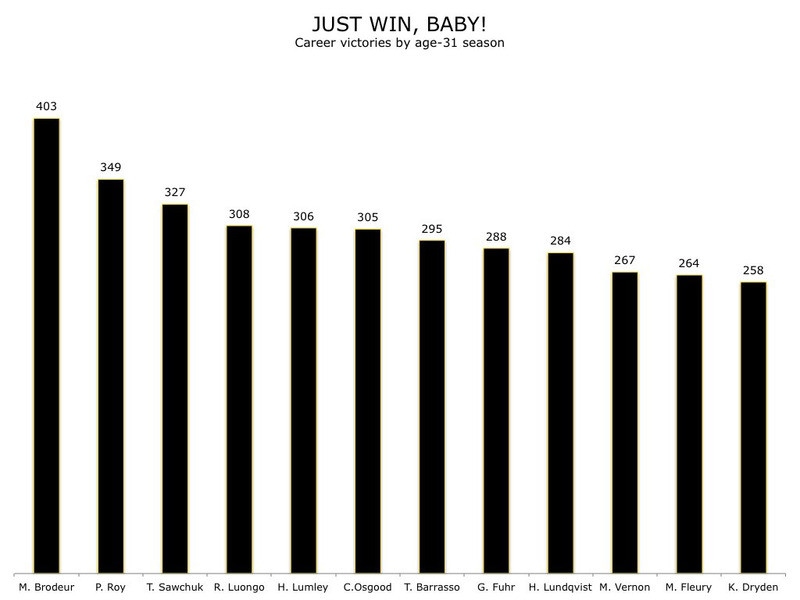 The next chart is those same goalies and how many wins they collected after their age-31 season. There's a lot of fluctuation in that group (even if Dryden, who retired at 31, is excluded). This is where the greatness of Brodeur and Roy is so evident. They're the only two goalies in NHL history to be elite for such an extended period of time. 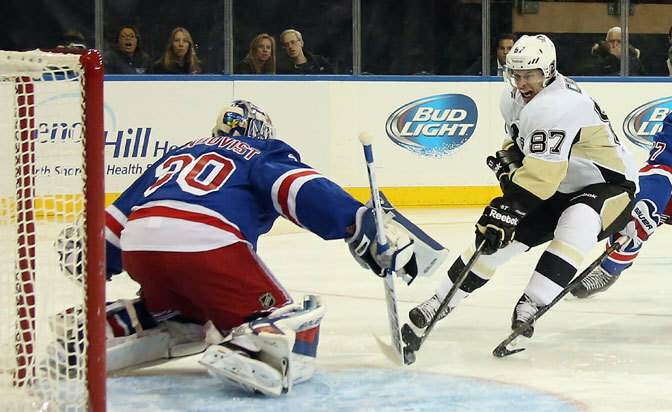 Will goalies like Luongo, Lundqvist and Fleury be able to do the same? DISCLAIMER: While the Super 16 is NHL.com's weekly power rankings, the new-look version is going to focus more on the "power" than the "rankings" when determining the order. It's not always going to look like the League standings and likely will take more of a long view than a short one. Stop by to see where your favorite team ranks but stay for the information. Also, statistics and team records are through the games Wednesday night. There already have been lots and lots of words written and said about the potential selections for various Olympic teams that will be heading to Russia in February, and it is only going to intensify in the next few weeks. That said, is it possible Joe Thornton's name is not being mentioned enough for Canada? He's old(er) and slow(er) compared to the players everyone has projected to play center for Canada. He also isn't going to fit on a wing. But he is having a really good season for the Sharks, and it might be worth bringing him along and then just figuring it out later. Sidney Crosby, Jonathan Toews and probably Ryan Getzlaf seem to be the consensus picks to center three-fourths of the Canadian forward corps. John Tavares and Patrice Bergeron also probably are in front of Thornton. But Thornton still might be the best passer in the League and he still wins lots of faceoffs. Also, everyone has focused so much on even-strength lines, but who would be better than Thornton on the half-wall on Canada's power play, assuming Crosby is down low and someone like Corey Perry or Toews is in the slot? Crosby or Toews or especially Tavares could play on the wing, or Thornton could be the 13th or 14th forward. Just seems like it might be worth taking him, almost like having that extra rescue club in the golf bag. What were these two dopes thinking? MUST READ: Michael Traikos of the National Post writes on what should be a popular topic for the next few months: Why this season finally could be different for the San Jose Sharks. The Blackhawks became approximately the 834th team in NHL history to follow a long, successful road trip by starting the first game back at home flat when they lost to the Dallas Stars 4-3 on Tuesday. Lack of desperation, needing to make up for time lost with the kids, etc. Chicago snapped out of it and still nearly beat a pretty good team. Here's a tip: Don't buy any friends who are Blackhawks fans an Antoine Roussel sweater for Christmas. MUST READ: Patrick Kane belongs in the discussion of "best forward not named Sidney Crosby," Sam Hitchcock of Intelligent Hockey writes. If being able to add Ben Scrivens, Matt Frattin and a draft pick for Jonathan Bernier wasn't enough, the Kings were able to remind everyone they have another pretty good young goalie Tuesday when Martin Jones made his NHL debut and helped the Kings beat the Anaheim Ducks in a shootout. The NHL was one Anaheim win from its first Freeway Series last season. The two teams are going to play at Dodger Stadium in January. If the Sharks keep winning the stars could align for the two clubs to meet in one of the most anticipated first-round matchups in a long time. MUST READ: Anze Kopitar will play for his father while helping make Slovenian hockey history at the 2014 Sochi Olympics, writes Tal Pinchevsky. It was a humbling week for the Blues, who got steamrolled early by the Sharks before making a game of it and then lost to the Kings. Los Angeles has defeated St. Louis in 13 of the past 15 meetings; of course eight of those victories have come in the Stanley Cup Playoffs. MUST READ: Katie Baker of Grantland writes about one of the great unsung traditions of hockey: The bond between players and their billet families. The Avalanche have followed a mini-slump (three straight losses) with wins in five of six, including victories against Los Angeles, Chicago, Phoenix and two against Minnesota. That's a pretty good couple of weeks. They remain sixth in the West in points but are second in points percentage. MUST READ: Adrian Dater of the Denver Post writes about Patrick Roy's philosophy on using statistics. The Bruins have the most wins of any team at home this season. They've outscored foes 46-30 en route to a 12-3-2 mark at TD Garden. They've also played the fewest road games (10) in the League, which is about to be corrected. Boston plays 15 of the next 24 away from home, including nine games in Western Conference buildings. If the other teams in the Atlantic Division are going to make a run at the top spot, the next few weeks might be a good time for that. MUST READ: Torey Krug has earned plenty of praise, but Steve Conroy of the Boston Herald writes about the progress the team's other young defenseman, Dougie Hamilton, is making. The Ducks have won three of the past 11 games. While 3-4-4 looks a little better than 3-8, the injuries and the schedule (this slump started near the end of a stretch of 12 games in 15 on the road) have caught up to Anaheim a little bit. What better way to snap out of it than road games this week at Chicago and St. Louis? MUST READ: The depth scoring has gone missing again in Anaheim, writes Derek Satterfield of Anaheim Calling. As the final month of Olympic audition season nears, there are a few players who clearly are generating the most discussion about their worthiness for inclusion on the Canadian entry for the 2014 Sochi Games. On defense, the lightning rod at this point clearly is P.K. Subban. There are several candidates for the final few spots at forward. The most intriguing might be Chris Kunitz, who is tied for third among Canadian forwards with 14 goals and tied for sixth with 28 points. Any discussion of Kunitz quickly turns to one topic: How he lost the 2003 Hobey Baker to Peter Sejna. No, obviously it is his on-ice partnership with Sidney Crosby. The two have been linemates every season Crosby has been healthy since Kunitz arrived in one of Penguins general manager Ray Shero's best heists, err, a trade with the Ducks during the 2008-09 season. The argument for Kunitz often is posited as he has great chemistry with Crosby. The argument against is he owes too much of his success to playing with the best player in the world. Other wings get tagged with this criticism as well (people can tell who played with John Tavares just by looking at the statistics of the forwards for the New York Islanders the past few seasons). It is possible Kunitz makes the team and plays alongside Crosby on Canada's top line. It is possible he gets left off the roster. There might not be an in-between. Is that fair? Is it possible that Kunitz could be just as successful playing alongside Jonathan Toews? Or maybe reunited with his old pals from Anaheim, Ryan Getzlaf and Corey Perry? Check out those three tables below. They show the Corsi-for percentage for Kunitz with and without Crosby (or Evgeni Malkin), Alex Ovechkin with and without Nicklas Backstrom and Perry with and without Getzlaf. Even two recent League MVPs have worse numbers without his team's best center. Kunitz might not be quite as dependent on Crosby to drive possession at even strength (Corsi-for percentage) as it seems. The sample size is too small to determine anything from this season, but in the past four he doesn't look like as much of a passenger as some people might suggest. MUST READ: Rob Rossi of the Pittsburgh Tribune-Review writes that Kunitz should be on the Canadian Olympic team. The Phoenix Coyotes haven't had five players with 50 points in a season since 1997-98. They haven't had more than six players with at least 50 points since 1996-97. They haven't had seven with at least 50 since the franchise was in Winnipeg, and the last time it happened they had a guy score 76 goals (1992-93). They have seven guys on pace for at least 52 points right now. MUST READ: An ode to Rob Klinkhammer, a perfect example of how the Coyotes have done less with more, writes Randy Holt of Five For Howling. Ryan Suter consumes lots of attention about the minutes he, well, consumes. One player who doesn't receive enough praise for the extra work he logs? Wild captain Mikko Koivu is sixth among forwards in average ice time at 21:24 per game and third among skaters who don't play for John Tortorella, behind only Sidney Crosby and Anze Kopitar. Koivu could get plenty of attention as Finland's No. 1 center in a couple of months. MUST READ: Michael Russo of the (Minneapolis) Star-Tribune writes about the Wild's struggle to find power-play goals (and power plays). The Canadiens are the hottest team in the Eastern Conference. David Desharnais has nine points in his past eight games after have one in his first 19, so that crisis has been averted. The province-wide outrage that might occur if Subban doesn't go to Sochi doesn't really affect the team. So yeah, times are good in Montreal, even if those of us who don't live there often are left to wonder how it ever can be really be bad. MUST READ: Just because, check out E.M Swift of Sports Illustrated on the beginning of Patrick Roy's legend in Montreal. One of the major storylines of the 2013-14 season has been the dominance of the Western Conference against the Eastern Conference. It is almost certainly going to mean a really good team (or two) in the West is not going to make the playoffs. Ten teams have had more than 90 points and not made the playoffs in NHL history* and another eight have reached 90 and missed out. The Canucks and the Dallas Stars are on pace to possibly challenge for the top spot on the list to the right. The margin for error is so slim in the West. Dallas is 8-3-3 since the start of November. That’s a pace for 111 points over a full season. On Oct. 31, the Stars were five points from the top eight in the West. They were six points back after the games Dec. 4. Vancouver has won three of four and moved to within a point of top eight, but even that optimism has to be tempered because the Canucks have played more games than the teams immediately in front of them. And given the way this season has gone, counting on the top eight teams in the West to lose games they have in hand might not be a great idea. *In this case, "history" goes back to the advent of the point for an overtime loss. Before that the threshold for postseason qualification was much lower because fewer points were available. MUST READ: John Tortorella returned to New York City this past week, which allowed some of his old pals in the media to write about him, like this from Jeff Z. Klein of the New York Times. Just when it looked like the Red Wings were a giant awakening from an early-season slumber, captain Henrik Zetterberg joined Pavel Datsyuk in the infirmary. This team is deep but still relies pretty heavily on those two at both ends of the ice. Provided Datsyuk comes back soon and Zetterberg's back issue doesn't linger, there's still time for the Red Wings to go on a run to the top of the conference. MUST READ: Gustav Nyquist and Tomas Tatar are two of the biggest reasons the Red Wings have been OK without Datsyuk, writes Helene St. James of the Detroit Free Press. The Wings have several more potential options at Grand Rapids, including that team's leading scorer, Tomas Jurco. Oh, and Anthony Mantha is destroying the Quebec Major Junior Hockey League with Val-d'Or as well. The sun isn't setting on Detroit anytime soon. Losing Stephane Robidas is not going to help the fleeting Cinderella in the West, and anything more than a short-term absence for Tyler Seguin likely will sink the Stars. Teams often win a game or three with major holes in the lineup as others feel the pressure to be better, but eventually that catches up to them. On a positive note, Seguin and rookie Valeri Nichushkin just might be an elite 1-2 punch at center someday soon. MUST READ: Steve Hunt writes about the team's options while trying to replace Robidas. The Lightning are having significant troubles scoring goals without Steven Stamkos. The power play has been especially poor. They've won four of their past 11 and have fallen to fourth in the Atlantic. Is the schedule about to come to the rescue? Seventeen of their next 21 games are against teams not in the top 16 in the League standings as of Thursday morning and none of the 21 are against clubs in the top eight. Of course this stretch is actually 18 of 22 games, with a 1-0 loss to the Columbus Blue Jackets a not great start. MUST READ: Damian Cristodero of the Tampa Bay Times writes about the growing concern with the lack of offense. After four-game winless skid (0-3-1), a trip to the I-95 corridor has treated the Jets well. A clean sweep of the New York-area teams and a one-goal loss to the Philadelphia Flyers looks a little better now than it would at the start of the season. Still, the power play hasn't been good (6-for-74 since Oct. 13) and they have issues with puck possession. The Jets are 12th in the League in Corsi-for percentage at even strength, but when the score is within one goal they are 20th. Really, this article could have been the Super 15 this week. The options for the last spot were not particularly enticing. MUST READ: Garret Hohl of Arctic Ice Hockey writes about Blake Wheeler's performance in his first season with the big contract.